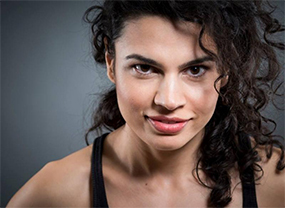 Alina Serban is a graduate of the Royal Academy of Dramatic Art in London (MA Theatre Lab programme), Tisch School of the Arts at New York University (Open Arts programme) and the National University of Theatre and Film in Bucharest. Alina Şerban’s life experiences as a Roma woman motivated her to start a platform promoting the expression of Roma voices and histories. Her latest project, Untold Stories, intended for international audiences, is an endeavour aiming at making visible Roma culture and history, through different cultural tools. In February 2016, Alina Şerban has published an on-line Collection of Roma Fairy Tales. In addition, she has written and staged the performance entitled The Great Shame, focused on 500 years of Roma slavery in Romania. Recent acting and devising credits include: Roma-Sapiens which premiered in autumn 2015 in Berlin, Writer – Performance for the Stockholm Literature Festival, The House Project and The Sun That Casts No Shadows for The Brighton Laboratory; Turfed for the London International Festival of Theatre; The Last Enemy for the BBC. She is one of four practitioners chosen to have an ongoing artistic residency with London International Theatre Festival. Alina Şerban has also written Home, a play about immigrants in the UK which won Stories of London Rich Mix's competition. Alina Șerban is known for her illuminating and highly acclaimed examination of conflicting identities, social discrimination, and for showcasing the redemptive force of self-expression. The performance I Declare at My Own Risk, inspired by the autobiographical story of the actress, a Romanian from the Roma minority, follows the dilemmas, challenges and revelations that accompany a girl from a poverty-stricken Roma community in Bucharest on her sinuous way to social emancipation as a performer trained in some of the best artistic schools in the world. I Declare at My Own Risk has been widely performed across Europe in countries including Romania, Hungary, Italy and France, and has gathered considerable critical acclaim. In the UK, the play was performed at the Royal Academy of Dramatic Art – RADA Festival in 2013 and was subsequently offered a development workshop at Oval House Theatre and a short performance run at Tara Arts in 2014. Hobo Theatre Company will present a full production of the play in the near future. Supported by Tara Arts and Arts Council England.